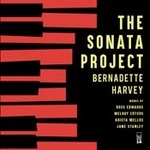 The Sonata Project / Bernadette Harvey, piano. Recorded/performed at: Verbrugghen Hall, Sydney Conservatorium of Music, on 2017. Aristea Mellos Bernadette Harvey 15 mins, 29 sec. Recorded/performed at: Verbrugghen Hall, Sydney Conservatorium of Music, on 2017. Melody Eötvös Bernadette Harvey 17 mins, 24 sec. Recorded/performed at: Verbrugghen Hall, Sydney Conservatorium of Mausic, on 2017. Jane Stanley Bernadette Harvey 21 mins, 28 sec. Recorded/performed at: Verbrugghen Hall, Sydney Conservatorium of Music, on 2017. Ross Edwards Bernadette Harvey 8 mins, 27 sec. The Sonata Project, the inspiration of pianist Bernadette Harvey, is an ongoing commissioning program for the creation of new large-scale compositions for solo piano. Through her performances and recordings of these works, Bernadette's mission is being realized - to provide a platform on which to amplify the work of 21st century composers, to enlarge the number of large-scale sonatas written by women composers, and to ensure the future of the solo acoustic piano recital. Liner notes include program notes and biographical notes about the composers and performer. Score: Piano Sonata No. 1 : The Demoiselle D'Ys / Melody Eötvös. Score [ePDF]: Sea star fantasy : for solo piano [eScore] / Ross Edwards. Score: Sea star fantasy : for solo piano / Ross Edwards. Score: Sonata : for solo piano / Aristea Mellos. Score [ePDF]: Sonata : for solo piano [eScore] / Aristea Mellos.